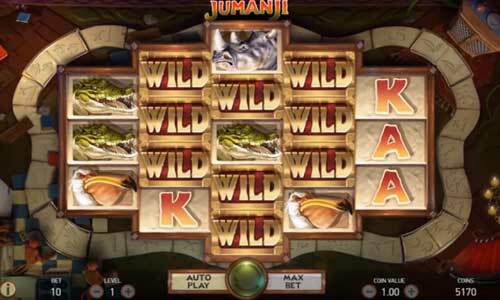 Jumanji is a 5-reel, 36-line game that's based on the Jumanji film. 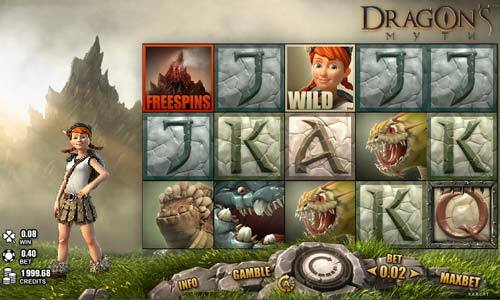 This game offers impressive features, including a board game bonus, wild symbols, and multiple types of free spins. The most-interesting thing about Jumanji is the reel setup. You'll see a 3-4-5-4-3 setup going across the five columns. This structure allows you to form plenty of payouts in unique fashion. 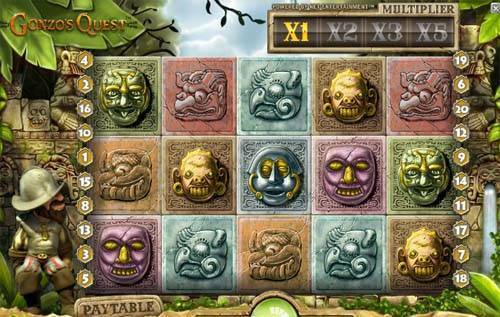 Monkey Mayhem – Symbols are shuffled randomly to create a guaranteed payout. Monsoon Wilds – A row of wilds go across one or two reels. Sticky Vines – You receive re-spins that can boost your win. All symbols that help form the win remain, while the other icons begin spinning. Wild Stampede – Rhinos stampede across the reels and randomly turn 4-9 symbols into wilds. Also note that you can unlock a board game bonus, which is triggered by three or more Jumanji scatter symbols. The board game sees you roll two six-sided dice in order to move your marker across the board. The goal is to pick up free spins, credit payouts, and extra rolls. Overall, Jumanji is an excellent blend of quality graphics, a beloved theme, and plenty of exciting features. 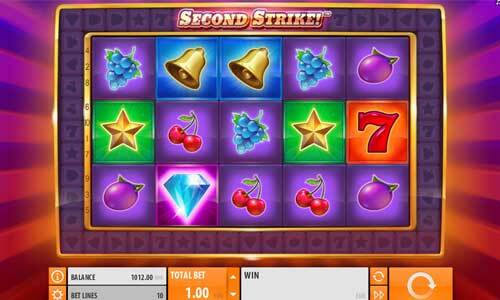 Second Strike may look like a classic slot when considering its basic symbols. But this 5-reel, 10-line game offers more than meets the eye. The Second Strike feature is what makes this slot totally unique. This feature revolves around the small symbols surrounding the reels. Every time you form a winning combination, flashing lights will move around the ring and hopefully land on the same symbols that appear in your winning combo. 3 triggering symbols adds 6 symbols to the reels. 4 triggering symbols add 8 symbols to the reels. 5 triggering symbols add 10 symbols to the reels (entire grid filled). Beyond the Second Strike feature, this game stands out with its bright graphics and vibrant sound effects. Quickspin has done an excellent job of blending classic and modern slots elements. Released in 2007, Mega Moolah is far from the most-recent slot on this list. But Mega Moolah is still highly popular due to its record-breaking jackpots. This Microgaming slot offers four different progressive jackpots, including the Mega, Major, Mini, and Minor prizes. The Mega jackpot is always worth at least seven figures and has grown to a record $21.5 million, which was set in September 2018. You can win these jackpots by triggering the Mega Moolah random bonus round. This takes you to a second screen, where you spin a wheel to determine your prize. Chances are that you’ll merely win one of the credit payouts on the wheel. But you'll also see spaces dedicated to the four aforementioned jackpots. The dream is that you'll trigger this bonus round and collect the Mega payout. 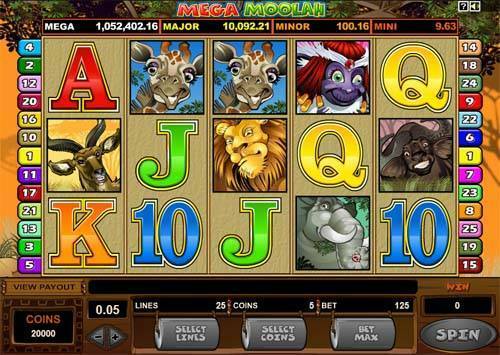 Mega Moolah also features a timeless theme that revolves around African Savanna animals. Lions, giraffes, elephants, monkeys, and yaks will help you form payouts until you can hopefully hit the big one. Dragon's Myth is a story about a young girl who protects her village from fire-breathing creatures. The best thing about this 5-reel, 20-line slot is its graphics and overall atmosphere. The background features a rugged terrain that it will remind you of the Scottish Highlands. The animations are also excellent and don’t lag, even when you use turbo mode. The soundtrack is yet another highlight to this game. You'll hear whistling winds, dragon roars, and triumphant sound effects as you score wins. Moving to features, you can earn free spins and bonus payouts. The free spins are triggered by three or more scatter symbols. The Dragon Bounty bonus payout is delivered when you put four or more dragons in cages. The biggest reason to play Dragon’s Myth is the graphics and atmosphere. But this game also has enough features to keep things interesting from an entertainment aspect. Guns N' Roses is the first release in the “NetEnt Rocks” series. This particular game revolves around the Guns N’ Roses (GNR) band, which has sold over 100 million records in its career. One thing to immediately love about this game is that you get to listen to several of GNR's greatest hits. This is a refreshing change from most slots, which have simple repeating soundtracks. 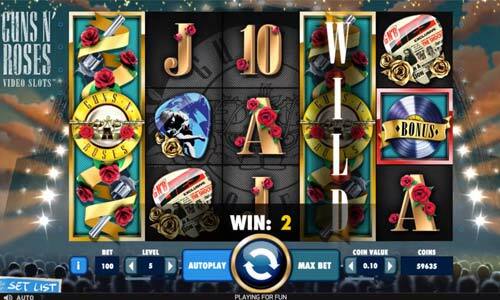 Guns N' Roses slots also offers a number of features, including Appetite for Destruction, expanding wilds, Encore free spins, Legend Spins, and a Solo multiplier. Bonus Wheel – Triggered by landing three scatter symbols on reels 1, 3, and 5. You get one of three bonuses, including Coin Win (win 10x-30x your bet), free spins, or Crowd Pleaser (select items for cash prizes). Expanding Wild – The Guns N’ Roses symbol is wild and can appear randomly on the reels. This wild can transform into an expanding wild, meaning it takes up an entire column. Legend Spins – You receive 3 re-spins, each featuring one or two stacked wilds. Appetite for Destruction – Features an expanded wild symbol in the shape of a cross. Combining Appetite for Destruction with other wilds can lead to huge payouts. Solo Multiplier – This random multiplier can enhance your payout 4x to 10x. You need to have at least three matching symbols in a payline in order to trigger Solo Multiplier. 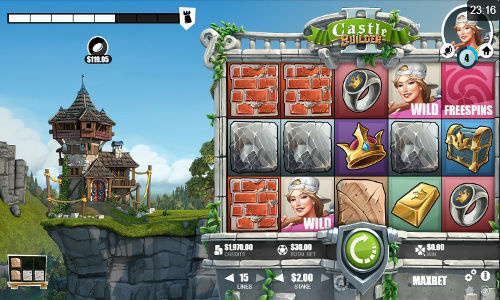 Castle Builder II is a combination of a slot and PC simulator game. The goal is to collect materials for castles that you must build for different kingdoms. We like how this game takes you to 15 kingdoms, ranging from wild jungles to snowy mountains. You need to land winning combinations in order to collect castle building materials for these lands. Castle Builder II gives you a chance to earn rewards and build your reputation across this medieval world. You'll also be able to unlock content and change the difficulty levels based on your preferences. The fact that you have access to so many different kingdoms and castles gives this game far more replay value than the average slot. It's also fun to watch your legend grow as you continue building bigger and better castles. 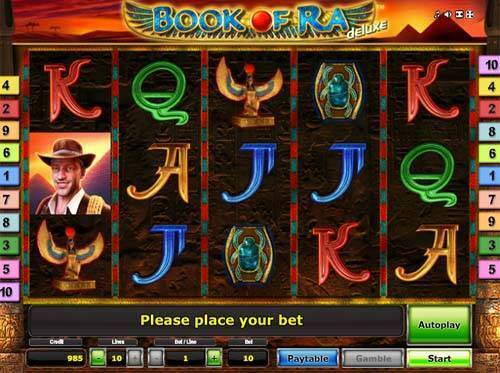 Book of Ra Deluxe is a perfect example of how an online slot doesn't need to have the greatest graphics or cutting-edge features. Instead, this 5-reel, 10-line slot is just a fun game that's appreciated by the masses. The theme sees you guide an Indiana Jones-type explorer into an Egyptian tomb. The goal is to find rare and valuable artifacts, which will lead to big payouts. The Book of Ra symbol is both the wild and scatter icon. This triggers free spins when acting as the scatter symbol. You receive 10 free spins and the ability to form expanding wilds. You can also use a gamble feature in order to increase your payouts. The gamble option sees you guess whether a card will be red or black. Guess right and you’ll double your payout. Released in 2009, Gonzo's Quest is one of the most-popular online slots of all time. NetEnt has done such a good job of making this game that it still compares favorably to modern slots. Gonzo's Quest became famous for being one of the earliest games to offer rolling reels. The rolling reels feature sees symbols from winning payouts disappear, thus allowing icons from above to take their place. This helps you form additional payouts after the reels stop spinning. Gonzo's Quest also offers an increasing multiplier as you continue collecting wins within the same round. Of course, rolling reels are nothing new in today’s slots world. But Gonzo's Quest holds up well and when considering that it has quality 3D graphics and a fun Spanish conquistador theme. Vikings Go to Hell follows a band of Vikings that are looking to eradicate evil in their lands. This 5-reel, 25-line slots features a somber but well-designed background, which includes detailed stone structures, dark skies, and a desolate landscape. One thing that makes Vikings Go to Hell stand out over other games is its role-playing aspects. Your characters earn experience points and increase their skills as you continue playing. Your Vikings will also fight evil monsters, including bosses that must be beaten at various levels. For example, level 2 sees your Vikings battle the Lord of Chains. You win the fight by hitting this evil creatures three times, thus turning the Lord of Chains into two sticky wilds. You'll also notice a rage meter on the side of the screen, which can trigger Bezerk Free Spins when filled. 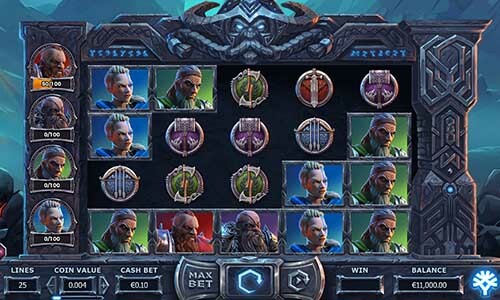 These free spins launch the Vikings into battle, where you'll rack up large bonus payouts. 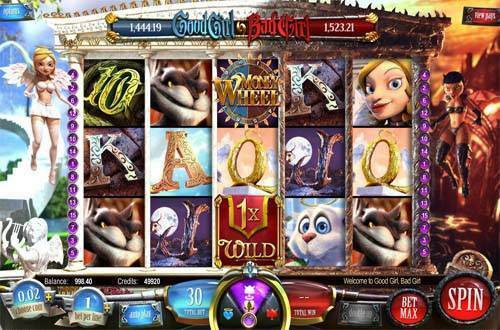 Good Girl Bad Girl features angelic and demonic girls fighting to control your slots destiny. But this has more significance than just a cool theme, because you can actually pick your side while playing. Choosing the angel's side means that you'll be playing for smaller payouts. However, the benefit is that you'll also experience less volatility and earn more-frequent wins. Choosing the demon's side is the opposite, because you'll experience more volatility and win less. The advantage, though, is that you can also look forward to larger payouts. Good Girl Bad Girl also features a cool gamble feature, where you're whisked away into the heavens. You need to choose whether the angelic or demonic side of the coin will come up. This slot has Betsoft's trademark 3D graphics and stellar animations. All of this combines to make Good Girl Bad Girl one of the most-entertaining slots on the market.